Is Less More in Ron Rash’s Above the Waterfall? 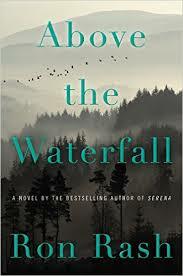 In Above the Waterfall, Les is a sheriff on the eve of retirement just trying to keep the peace…find some peace…in his small North Carolina mountain town. Becky is an environmentalist with the streak of a poet working as a park ranger and taking refuge in the natural beauty of her environs. While high-end resorts push natives (both human and animal) to the fringes, meth poisons the town’s less hardy residents. Ron Rash, while ever vivid in his descriptions of his Appalachian universe, attempts to go poetic minimalist here, alternating POV’s between Les’ fact-based fatalism and Becky’s yearning artistry. This attempt to balance timely sociopolitical commentary (meth came after the 2008 crash) with a timeless aestheticism (one wonders if Rash is working on an Appalachian Poetry side project) threads thin…the polar opposite of the epic gothic complexity of Serena. Unlike the meth, much of the novel feels undercooked, as if it began as a short story that Rash later fleshed out, and those who enjoy his modern short stories will connect to this more than those who lean towards his period-piece and cross-generational novels (such as Serena, The Cove or his earlier One Foot in Eden). I fall into the latter group, and thus had mixed feelings for this effort, especially as it devolved into a not-so-compelling and seemingly manufactured “who-dun-it” concerning the poisoning of trout.